If you've held back from feeding your pet a raw diet over concerns about its safety, nutritional value, or price, we urge you to read these five facts and reconsider your pet's current diet. Today's post is for all you raw pet food skeptics! If you've held back from feeding your pet a raw diet over concerns about its safety, nutritional value, or price, we urge you to read these five facts and reconsider your pet's current diet. Dogs and cats evolved to survive and thrive off of a raw diet. 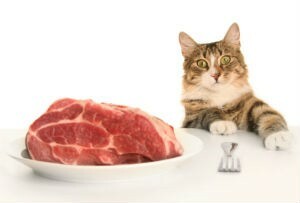 Cats and dogs evolved successfully off of an Ancestral Diet of hunting and scavenging; they thrived off of this raw diet. In fact, contemporary nutritional science increasingly supports an Ancestral-type Diet – high protein, balanced fats, and at least some fresh foods – as the healthiest approach to feeding most dogs and cats. Raw pet food is NOT necessarily more expensive than other foods. It is true that a bag of raw pet food may cost more than a regular bag of pet food from the grocery store, but when you look at the price per serving, raw pet food can actually be cheaper. Preparing raw pet food will NOT make you sick. Pet owners have been feeding raw diets to dogs and cats for decades, and to date, not one documented case of a person infected by a foodborne illness caused by exposure to raw pet food has been reported. Commercial pet food is (definitely) NOT better for your pet. Unfortunately, commercial pet food diets have thousands of proven cases of health issues. Most of the problems are directly related to poor manufacturing conditions and low quality of ingredients. Manufacturers in the commercial pet food industry usually will not disclose very much information about the sources of ingredients, how they are processed, their quality control standards, or, in some cases, even where the food is made. Raw organ meat is safe (and healthy) to feed! Organ meats provide great nutrition, are nutrient dense, and easily digested. Organ meats are also highly digestible and excellent sources of protein. While some organ meats have higher fat and cholesterol levels than traditional meats, dogs and cats are capable of consuming a wide range of dietary fats while still maintaining normal lipid levels. Still have some reservations about feeding raw? Feel free to leave your questions for us in the comments below.